The girls picked out some great pumpkins and I will have my work cut out for me next weekend when it comes time to carve them all out. You can can view the pictures from the MUMC Pumpkin Patch by clicking on the picture below or by clicking here. This past Sunday we went to the Jacksonville Zoo to participate in the HEAL First Coast Zoo Walk for Autism. If you weren't not aware, April is Autism Awareness month. We met up with the group from Caitlyn's school "Little Star Walkers" and spent the morning supporting a great cause. The HEAL! Foundation (Healing Every Autistic Life!) is a local foundation serving the Greater Jacksonville Area and is also a supporter of Little Star Center of Jacksonville. It was an early start to a Sunday morning, but the weather was great and everyone had a great time walking the zoo. You can view pictures from Sarah's Birthday Bash by clicking on the picture below or by clicking here. Alan Pickert of Terrell Hogan has been chosen for the 3rd year in a row as one of "Florida's Super Lawyers" for 2009 and has also been chosen for the 4th year in a row as one of "Florida's Legal Elite" for 2009. This places Alan among the top 2% of all attorneys in the state of Florida. Alan is known for his outstanding work in Asbestos, Auto and Vaccine Injury. If you recall, Alan Pickert won Caitlyn's case in Vaccine Court back in 2007. Alan,You remain a blessing and we appreciate everything you continue to do for our family. Congratulations once again on these 2 awards Alan, you definitely deserve them. "The Fed announced it will pump a $1 trillion into the system by buying debt from our treasury." We celebrated another wonderful year of my lovely wife & mother of my beautiful children. Every year I am more and more amazed with how blessed I am to have Sarah by my side. To celebrate the occassion, we had friends over for a cookout while we all relaxed and enjoyed the time together. A great time was had by all and we a thankful for all who attended. You can view pictures from Sarah's Birthday Bash by clicking on the picture below or by clicking. Back in March we packed up the family and headed south to Orlando for a Disney weekend with the family. This turned out to be an interesting trip to say the least. We ended up making the best of the situation and enjoyed 2 nice days at the parks. You can view pictures from the Magic Kingdom by clicking on the picture below or by clicking. You can view pictures from Hollywood Studios by clicking on the picture below or by clicking. Recently I celebrated yet another Birthday and the sad realization I am getting older. 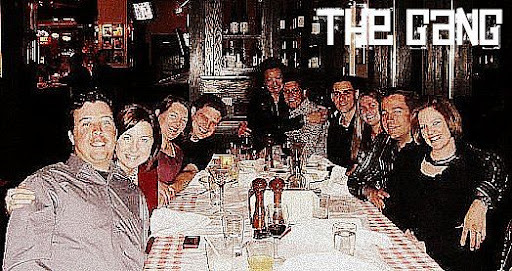 To celebrate the occasion we invited the group "The Gang" out to one of our favorite places, Maggiano's Little Italy, for a nice family style dinner. We had a great time and ate way too much food. I look back over this past year of my life and I am amazed at what has taken place and the progression of everything. I can look back and smile, I am grateful for my family and my friends. Thank you all for a great year. You can view all the pictures from Chris' Birthday Dinner by clicking on the picture below or by clicking here. On Friday Leslie Weed & Sarah Hoiberg were asked by First Coast News to discuss the recent court ruling regarding the link between Autism & Vaccines and to talk about the need for safer vaccines. U.S. Special Court: Measles Vaccine Not to Blame for Autism, A special U.S. court has ruled against parents with autistic children, saying that vaccines are not to blame for their children's neurological disorder. This past January Laura & I traveled up to New Jersey for my Dad's Birthday and to visit with family. We had a great time and it was a nice to spend some one on one time together. On Saturday we made a trip into the City. My Dad, Laura, & I grabbed the train in New Brunswick and made our way to New York Penn Station. We arrived in the City and made our way up through Times Square and then over to the FOX News Studio. You can view all the pictures from of our afternoon in New York City by clicking on the pictures below or by clicking here. Next stop was Rockefeller Center to see the Christmas Tree. The Tree was beauiful, this one actually came from Hamilton New Jersey. Afterwards we made our way further uptown to the World of Disney Store. Shortly upon arriving, we found out Cinderella was going to be visiting. We quickly made our way upstairs and Laura was able to say hello and take some pictures. At this point we were ready for some food before heading back downtown. The next stop was the M&M World store in Times Square where Laura picked out various crazy colors of M&M's (pink, purple, lavender, & turquiose). We proceeded to make our way back to Penn Station, grabbing a pretzel for Laura along the way, and hopped the train back to Jersey. On Sunday we made a trip out to see my sister's & brother-in-law's and Laura's cousins for some ice skating and dinner. The kids had a great time and it was nice having a chance to catch up with my sister's. You can view pictures of Laura Ice Skating by clicking on the picture below or by clicking here. We celebrated New Years Eve with some of our closest friends once again at P.F. Chang's. It's starting to become a staple for us. This was the second year in a row at one of our favorite places to eat. You can view pictures from of our evening at P.F. Chang's by clicking on the picture below or by clicking here. On Sunday Sarah & I loaded up the kids and took them to Disney's Hollywood Studios. We spent the entire day in the park taking the kids around to all the rides and the shows. Both Caitlyn and Laura had a blast. We were able to see Playhouse Disney as well as a couple characters. We ended up staying longer than we planned, but we were having such a good time walking the park and enjoying the evening. You can view pictures from of our afternoon in the Animal Kingdom by clicking on the picture below or by clicking here. On Saturday we decided to take the kids w/ Grandma & Grandpa T, and Uncle Timmy to Disney's Animal Kingdom. We had a great time enjoying the park and the weather was great once again. We spent much of the afternoon in Africa as many of the animals were located there on the Sahara. We eventually made our way around the park and managed to ride Everest. Amazing, that's all I have... At the end of the day, we managed to get front seats for the Christmas Jungle Parade. After the Animal Kingdom Park closed, Sarah & I took the kids back to the Magic Kingdom to see the parade and the fireworks. This was the first time we were able to see the fireworks and it was well worth it. You can view pictures from of our evening in the Magic Kingdom by clicking on the picture below or by clicking here. A couple weeks ago we took the kids along with the Grandparents & Uncle Timmy down to Orlando for a weekend vacation. We arrived late Thursday night and made our way to the magic Kingdom just before noon on Friday. We spent most of the day taking the kids on the rides and enjoying the beautiful weather in Orlando. All the parks were decorated for Christmas which was a great treat for the kids and helped to get us all in the Christmas spirit. You can view pictures from of our afternoon in the Magic Kingdom by clicking on the picture below or by clicking here. You can view pictures from of our evening in Epcot by clicking on the picture below or by clicking here. New addition to the Hoiberg Family ...Caitlyn's new puppy Molly. We have a new addition to the family, her name is Molly and she is a Shih Tzu. We picked her up a couple weeks ago. She is already 4 months old and is doing very well getting house broken. As you can expect, Caitlyn & Laura are very excited about having a puppy. Caitlyn is doing very well with Molly and Laura is helping out daily responsibilities. Molly follows Caitlyn throughout the house and is getting attached to both girls. She's still needs some work with the chewing, she has a thing for running into Caitlyn's room and grabbing her toys. You can view pictures from of Molly by clicking on the picture below or by clicking here. Happily married to my beautiful wife, Sarah, of 10+ years, we are the proud parents of two beautiful girls. Our youngest daughter, Caitlyn, was Vaccine Injured at 18 months of age by the DTaP Vaccine. Chris is a Systems Administrator with an Environmental Engineering Firm & also has owns his own business, InterLynk Systems, which specializes in Small Office / Home Office Networks as well as Computer Services & Sales. Sarah is a Homemaker & also helps her mother out in her business, Laura Cate Creations. David Kirby - "Evidence of Harm"
Do you believe Childhood Vaccine's can cause injuries? Back in January of 2005 Sarah Hoiberg took a perfectly healthy baby girl of 18 months into the pediatrician for a scheduled round of vaccinations. Little did the Hoibergs know that their lives were going to be changed forever within the next 24 hours. Caitlyn was a late sleeper and would usually not wake up until 10:00am. Sarah was home with Caitlyn and suddenly heard a voice tell her, Go check on Caitlyn. Sarah went to Caitlyns room and found her lying in a pool of dampness on her bed completely unresponsive. Sarah picked up Caitlyn and her head fell to one side. Caitlyns body was stiff on one side and loose on the other. Immediately Sarah called 911, the neighbor down the street, being a Fire Fighter, rushed to our house after hearing the call go across the dispatch. Our neighbors were able to aid Sarah while Jacksonville Fire & Rescue Department was in route. JFRD arrived and immediately tended to Caitlyn trying to get, what we had just found out were seizures, under control. All this time Sarah kept telling the paramedics, She just had her shots yesterday. At this point Chris Hoiberg was leaving the dentist and on his way to meet Sarah at the ER. Once at the ER, Caitlyn was immediately taken in and the ER staff began attempting to stop the seizures. Eventually she had enough drugs onboard that the seizures stopped, but by this point, her brain was so tired that all she was doing was laying there in an unconscious state. We eventually made it up to a room in the PICU (Pediatrics Intensive Care Unit). Caitlyn did not wake for several days after being admitted into the Hospital. During this time, Chris & Sarah kept telling the doctors, She just had her shots yesterday, but it was falling on deaf ears. It wasnt until all those tests were run that Chris & Sarah received the devastating news from Caitlyns neurologist that Caitlyn did in fact have a Brain Injury, an Acute Encephalopathy of the right front temporal lobe of her brain. This was the devastating news that confirmed what Chris & Sarah had thought all along. What an Acute Encephalopathy of the right front temporal lobe of her brain meant for Caitlyn was life changing. As humans, we are cross wired, the right side of our brain controls the left side of our body as the left side of our brain controls the right side. Speech and fine motor skills are located in the front of the brain. Most people have their speech and fine motor skills in the left side as most people are right handed. But studies have shown that people predominantly left handed can have their speech and fine motor skills in the right side of the brain. Caitlyn was a lefty, the only one in our immediate family (Chris comes from parents that were both left handed). Since the injury was in the right front temporal lobe, Caitlyn had lost all her speech, fine motor skills, and control & movement of her left side extremities. For weeks Caitlyn laid in the hospital, in and out of the PICU. Family by her side 24/7, there was not a single moment that either a family member or close friend of the family was not in the room with her. The Hoibergs were sleeping in the PICU with Caitlyn every night and family would relieve them during the day for short breaks to clear their head and get fresh air. Eventually Caitlyn made it out of the PICU and into a room. At this point the Hoibergs were able to setup a schedule. Sarah would be there during the day, Chris would come by after work and spend the night and wake up the next morning and go to work to have Sarah come back and stay during the day. Family & friends would take care of Laura, Caitlyns big sister, and get her to and from school and provide care for her in the evenings. One night a week, family would spend the night to allow for Chris, Sarah, & Laura to have one evening at home together during the week. During their time in the PICU, Caitlyn had more seizures and the Hoibergs almost lost Caitlyn on several occasions. A day or so before Caitlyn was to go home; her neurologist came by to check on Caitlyn and told the Hoibergs they needed to file an Adverse Reaction Report with the VAERS (Vaccine Adverse Event Reporting System) website which is a cooperative program for vaccine safety of the Centers for Disease Control and Prevention (CDC). Chris & Sarah later found out that their Pediatrician had sent the form in as well. Caitlyn went home close to a month after being admitted to the ER on Chris Birthday. When the Hoibergs brought Caitlyn home, she could not sit up nor hold her own head up. Caitlyns muscle tone had deteriorated from being in the hospital for close to a month without the ability to move her muscles. All Caitlyn could do for several months after was sit in a feeding chair and moan. Things did eventually start to get improve after Sarah immediately started Caitlyn into intense PT (Physical Therapy), OT (Occupational Therapy), & ST (Speech Therapy). Sarah did not waste any time getting Caitlyn into these Therapies. What the Hoibergs learned is that, even with the damage the shot caused, was not all lost, childrens brains are still developing at an early age and their brain is still like plastic, it is still molding and there is still the possibility of remapping what was lost, but this requires intense therapy. Caitlyn reached a milestone when she started walking again (with the aid of a brace). This was something the doctors told the Hoibergs not to expect Caitlyn to be able to do again. To this day, Caitlyn has very limited use of her left arm; she does not talk, and has trouble understanding right & wrong. Caitlyn has been hospitalized several times since her initial visit for seizures. Caitlyn is almost always smiling; she is capable of using sign language for very limited requests and can now run. She is however attending ABA (Applied Behavioral Analysis) schooling 5 days a week with one on one teaching. She is still receiving PT, OT, & ST is also doing Hippotherapy. To this day, the doctors cannot speak to what lies ahead for Caitlyn, the Hoibergs are in uncharted territory and doing the best to get Caitlyn what she needs for what they believe will be a full recovery.